Jorginho Must Be Blaming Himself For Joining Chelsea Instead Of Man City. WHAT must Jorginho have been thinking as he boarded the team bus back to London? Pep Guardiola spent almost the whole summer trying to sign the Italy midfielder for Manchester City. He viewed the former Napoli man as the ideal addition to provide back up for Fernandinho — and eventually replace the peerless Brazilian. Then at the last minute — much to the frustration of the Premier League champions — he opted to join Chelsea, linking up again with his old manager from the San Paolo, Maurizio Sarri. 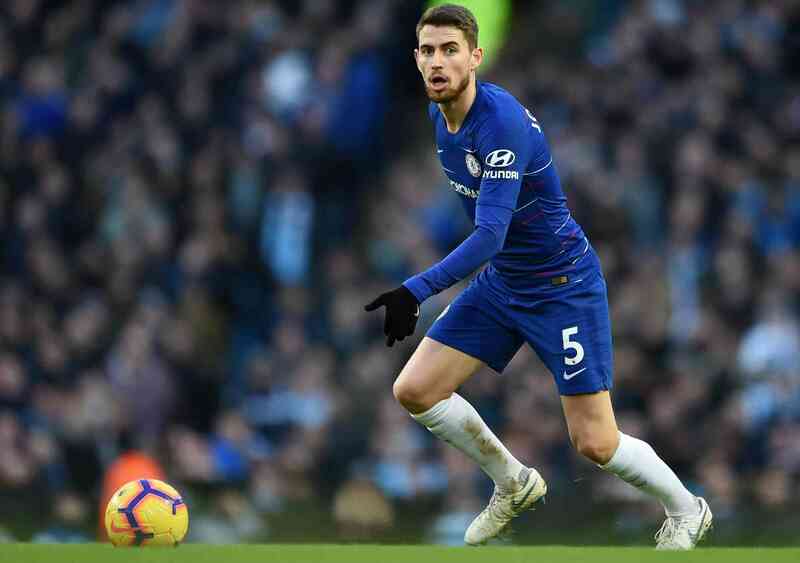 Yesterday, Jorginho finally made it to the Etihad. And how he must have wished he could turn back the clock. In 25 bewildering minutes after kick-off, the £57.4million signing seemed to have no idea what was going on around him. Sure, City were at their irresistible best, scoring four times inside the first half hour — and only Sergio Aguero will know how it was not five. But Chelsea were a complete mess, only really getting started once it was way too late. 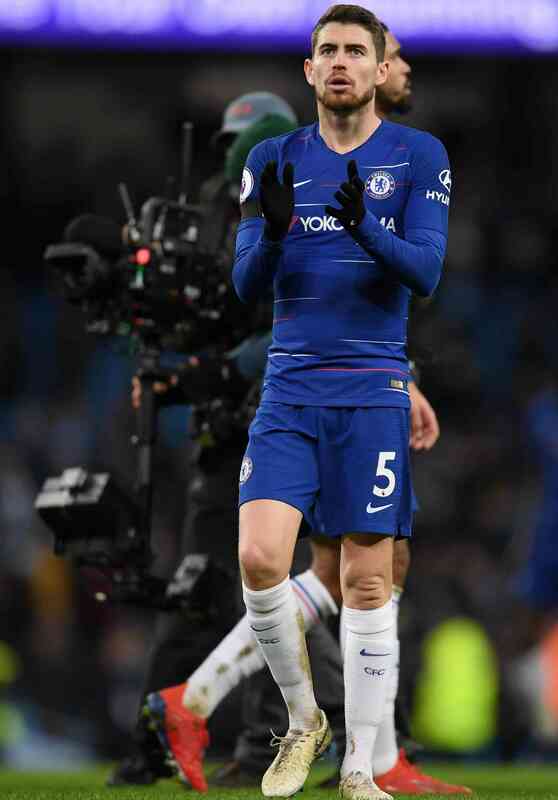 Jorginho might as well have come off and watched from the sidelines for all the good he did in stopping the Sky Blue tide. And to think, he could have been part of it if only he had not dragged his heels for almost the whole summer. 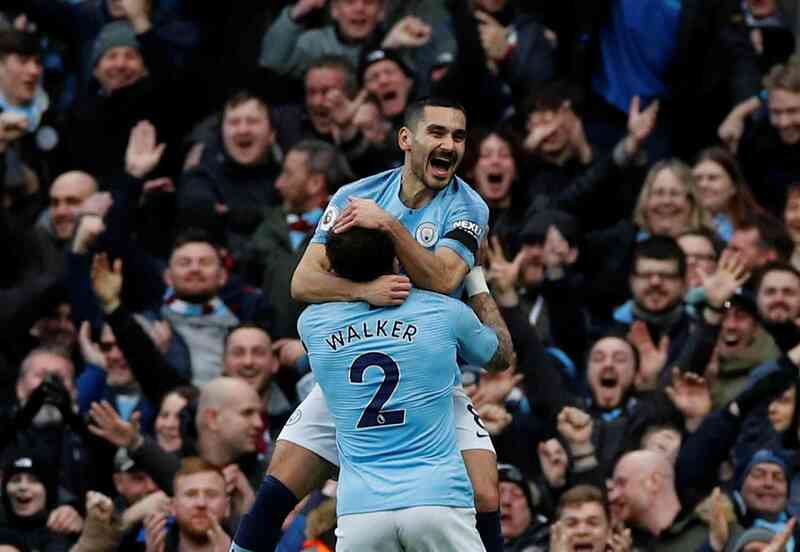 It’s hard to know exactly where he would have fitted into this Guardiola team — with Fernandinho showing no signs of slowing down and Ilkay Gundogan impressing. Maybe, that is part of the reason why he snubbed the move to City — because he feared he would not play. But as with Fred and Alexis Sanchez, it is safe to assume Guardiola will not be losing too much sleep over it now. Instead, the 27-year-old chose to be part of a Chelsea team who look a long way off the leaders in every sense. 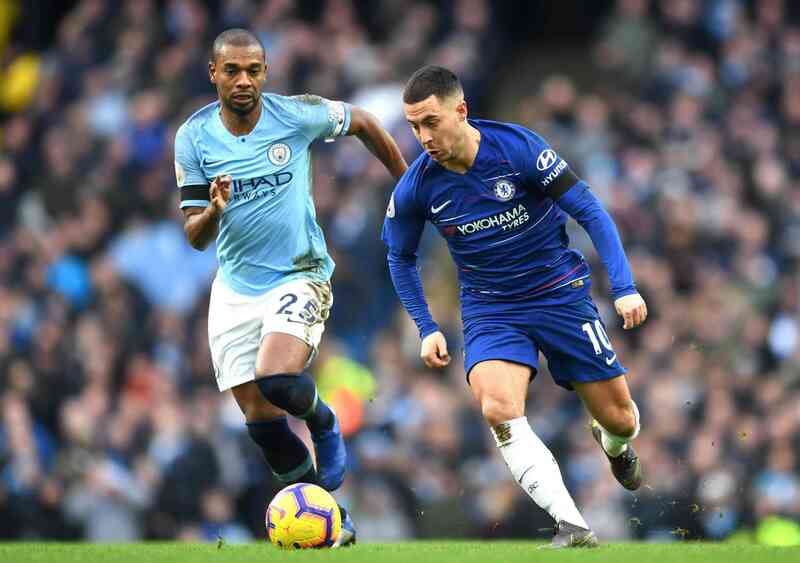 A glance at the team-sheet had many observers predicting Sarri’s men had the firepower to cause problems for the champions, who had endured a tiring few weeks. And they did — occasionally. 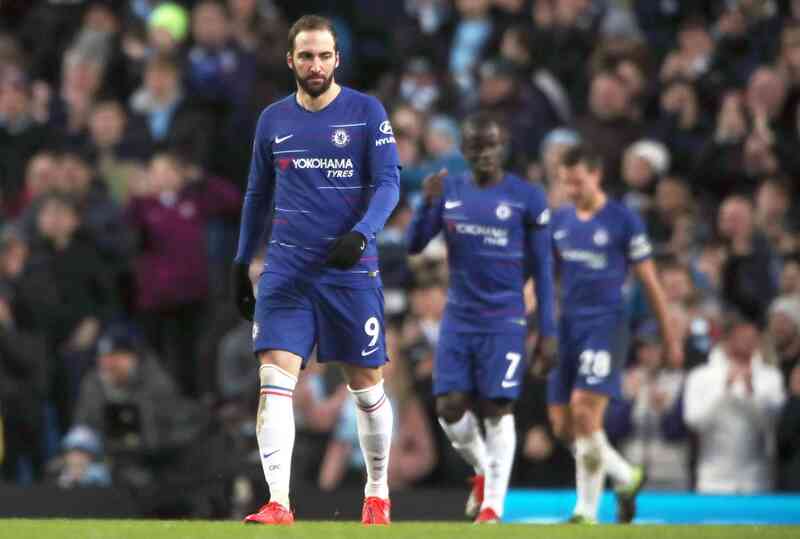 Gonzalo Higuain and Eden Hazard both had their moments. But that is no good when your team is such a shambles defensively. Sarri wheeled out three of the back-line who shipped four at Bournemouth in their last away fixture. And, not surprisingly, t hey were no match for Guardiola’s free-scoring side. Almost a year ago, Chelsea lost by just a single goal here — despite being second best by a country mile. This time, there was no hiding place as City were absolutely ruthless. 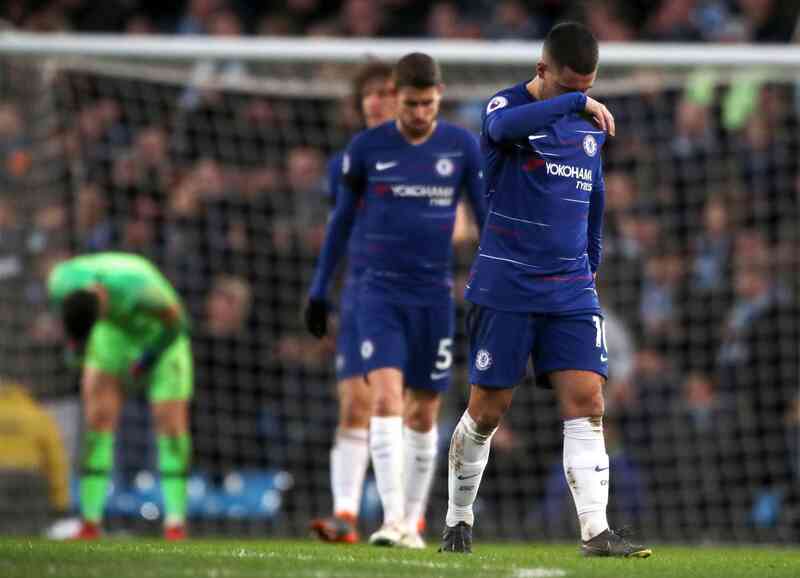 Marcos Alonso, Hazard and Ross Barkley were all caught napping from the quickly taken free-kick that saw City take the lead. 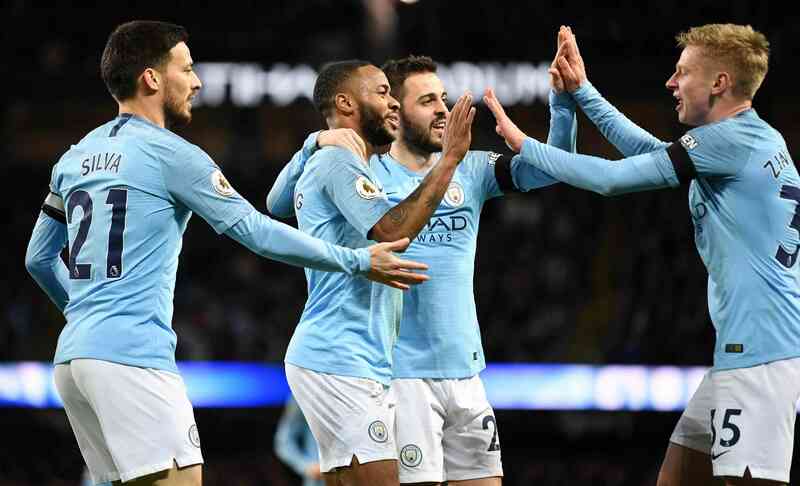 Antonio Rudiger and Cesar Azpilicueta were both guilty of mistakes that led to City goals. 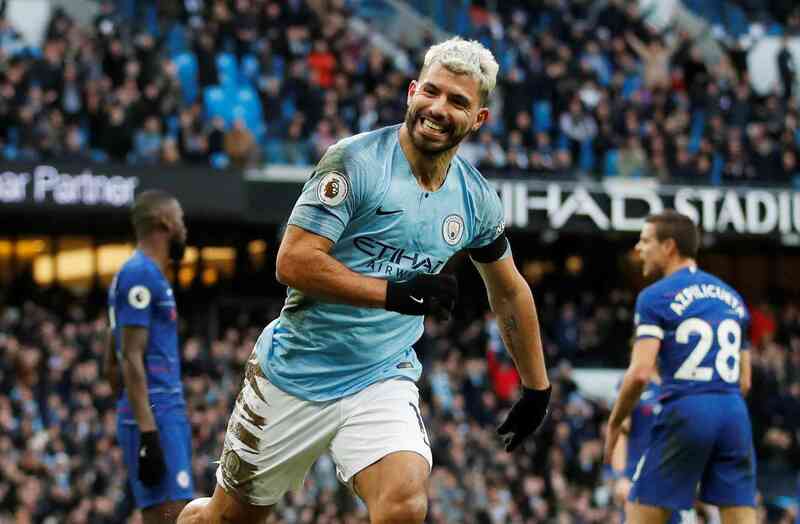 But, perhaps, none were as disastrous as the woefully short back header from Barkley, which simply gift-wrapped Aguero’s second goal of the afternoon. Meanwhile, David Luiz renewed hosilities with his fellow South American Aguero, who was sent off here two years ago for an ugly lunge on the Chelsea defender. It’s fair to say the City legend got his own back here in some style, helping himself to yet another hat-trick. If the Argentinian had got five — as he could have done — it would have been a fairer reflection of his dominance over his rival. And to think that they have to do this all again in a couple of weeks’ time at Wembley for the final of the Carabao Cup. The question must be: Can Sarri survive until then? His side have conceded ten goals in their last two away games and are now out of the Premier League precious top-four places. French pair Zinedine Zidane and Laurent Blanc are watching the latest meltdown unfold from afar. THE LEGENDARY LETTER WRITER, CHIEF OBASANJO SEEMS TO HAVE LOST HIS PEN. PDP accuses INEC of taking directive from APC.